Splendid People received 5 stars in BIAFF 2008. 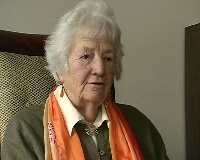 Splendid People is based around an interview with Sonia Rolt, widow of writer L.T.C. Rolt. 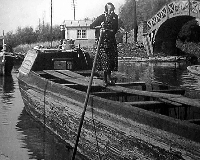 Sonia was one of the young women recruited by the government during World War II, to work as trainee boatwomen running pairs of 70ft narrowboats carrying essential materials on the canal system.At the end of the war, when all the others left, Sonia remained and spent a further five years as a working boatwoman, later marrying Tom Rolt who co-founded the Inland Waterways Association. 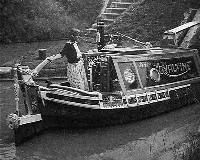 Robert Langdon It was during Sonia's time on the canals that she met and became friends with an amateur photographer, Robert Longden, who used to record the scene around Hawkesbury Junction near Coventry. 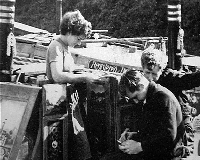 Many years later Sonia was able to gain access to some slides that had survived when his negatives and photographs had been thrown out after his death. Sonia'a house My wife Von and I have known Sonia for a good number of years and we've become friends. 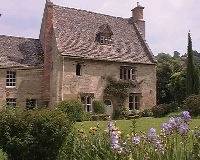 Each year we rent a cottage, idyllically set in an old cider orchard, behind her 14th century house in the Cotswolds. When her book of canal photographs came out we bought a copy and took it for her to sign. Interviewing Sonia It was in 2002 that I thought that I ought to record Sonia's memories of her time on the canals, again without any idea how I might use the material. Sound was recorded via a tie-clip mic. It's a bit 'toppy', a factor which elicited one or two adverse comments from the BIAFF judges. As a result I've since tweaked the base and treble response in Adobe Premiere. Sonia is a perfect interviewee and an excellent speaker - she often gives talks to various groups about her life on the canals. She is totally unfazed by the camera and was, in fact, interviewed for the BBC Countryfile programme on board a narrowboat at the 2007 National Waterways Festival. My interview with Sonia lasted 25 minutes with just four brief pauses. The tape was then consigned to the cupboard along with the others. It was 2005 before I listened to the interview tape again and I'd also been having another look at the book of photographs. It occurred to me that by using some of Sonia's words, illustrated by the pictures in the book, there was, perhaps, the making of a film. Should be a 'piece of cake' - I thought! 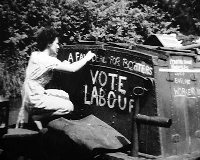 The first step was to film some of Sonia's own wartime photographs in her album whilst staying at the cottage. Back home I then set about selecting and filming the pictures in the book - most of them in fact. My usual method is to stand a book upright with the pages held flat with bulldog clips and kept from closing by means of an old burglar alarm battery. For illumination I use an Anglepoise lamp. With the book upright on the bench I can easily perform zooms, pans and tilts to give some movement. 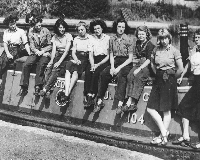 As well as Sonia's own photographs, and those of Robert Longden, I needed a picture of a group of trainee boatwomen. A trawl through the canal books at our local library brought up one which just fitted the bill. However, I would need to clear the copyright - the Longden images were no problem, Sonia holds the copyright on those. The acknowledgements at the back of the library book told me that the photograph was part of a particular collection. 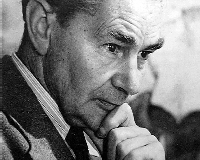 Research on the internet suggested that the collection was held at The Boat Museum, Ellesmere Port in Cheshire. I rang the museum and explained about the film I was making and the photograph I was after. The lady there didn't think they had that collection but she would check and ring me back. A week later she called to say no they definitely didn't have it but there was just a possibility it might be at the National Waterways Museum in Gloucester. It so happened that the following weekend we were planning a visit to Ellesmere Port as we'd never been before and I needed a shot of a traditionally sheeted up narrowboat. Whilst there we met a lady volunteer who was herself doing some research. I told her about my film and, after describing the photograph she said she was confident that it would be at Gloucester. The archivist there was a Caroline Jones who was usually prompt at answering emails and she gave me her address. As we were going down to the Cotswolds again in a couple of week's time I quickly contacted Caroline, describing the photograph. She replied saying she was certain they had it and suggested we made an appointment to visit. The Archive is tucked away in an attic at the top of the Waterways Museum which is housed in an old warehouse at Gloucester docks. 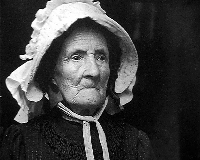 Caroline had the album of photographs ready and, sure enough, there was the one I wanted. Then, on looking through the other photographs, I found another three that would fit my commentary perfectly. As my film was for non-commercial use she agreed to waive any copyright fee but I would have to pay the standard charge of £6 plus VAT each for scanning the negatives. A worthwhile investment I thought. She also asked for a copy of the film for the museum. To complete my Cotswold filming I just needed a few introductory location shots. 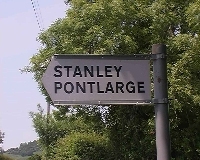 First, a close-up of the sign-post bearing the name of the hamlet where Sonia lives - Stanley Pontlarge. 'Pontlarge' is of Norman French origin and sufficiently unusual to grab an audience's attention. 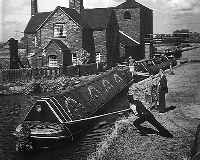 Robert Longen's photographs were mostly taken at Hawkesbury Junction where the Oxford and Coventry canals meet, and shots of the junction as it is today would make an effective ending to the film. As it isn't far off our regular route from the M1 motorway it would mean only a slight detour. I had hoped to do the filming on the way down but it was Spring Bank Holiday 2006 and, needless to say, the weather was absolutely appalling with heavy rain. With everything 'in the can' the first job was to copy the Sonia interview onto VHS tape with the timecode burnt in. This was then used to select and log the sections that would tell the story and be illustrated by the photographs. 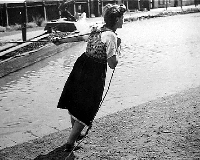 Similarly the tape of the photographs was copied along with its timecode, as were the modern-day Hawkesbury shots. The book-signing sequence, together with the house exteriors, had been shot on my Hi8 Sony V800 which was now no longer operational, so the material was transferred onto Mini DV using a borrowed Digital 8 recorder before copying to VHS. My usual practice is to write a draft commentary then make an off-line linear edit using the timecoded VHS, modifying the commentary as I go along. 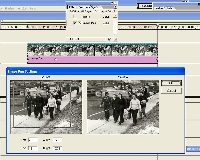 The timecodes of each shot are then logged for capturing in the computer. Selecting the clips in timecode order avoids running the camera backwards and forwards when capturing. In the case of Splendid People I only linear edited the live action sequences. For the rest, I inserted photographs on the Premiere timeline to fit Sonia's comments and wrote commentary to fit further photographs as I went along. Sonia is quite photogenic but it is always a good principle to limit the amount of 'talking head'. 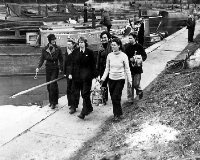 The commentary mentions the government's scheme for trainee boatwomen whilst Sonia is signing the book, so that was the point I had to cut to the photograph I had found in the library book. However, I then had to cut back to the book-signing and later dissolve to the interview - not very satisfactory. Finding the additional photographs in the Waterways Museum archive solved the problem perfectly, fitting the commentary and also Sonia's opening line. Applying the image pan effect With the film assembled it was time to set about adding some life to the photographs. I had done some camera movements when copying but most were static and I had no wish to end up with a slide show. However, I found that using the motion effects in Premiere resulted in a slight, but perceptible loss of image quality. A fellow club-member came to the rescue by suggesting the use of the 'Image Pan' effect, one I had never looked at before. It proved to be the perfect answer with no degradation of the image and easy to use, providing the ability to simulate panning and zooming with the camera. 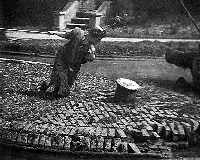 I also found that applying the motion, or even the image pan effect, could sometimes result in patterning of the image. That problem was solved by exporting a frame and re-importing it as a bitmap image back into Premiere. The next stage was to reduce all the photographs to the same level of black and white. This was done by means of the saturation effect, taking it down to zero. 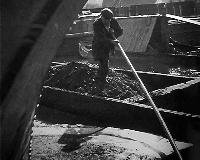 It was also applied to a coloured live-action sequence comprising shots taken from my film Waterway to Wales. I used it behind Sonia's description of the pleasures of travelling along. There is a Black and White effect in Premiere but its use creates a significant drop in image quality and is best avoided. For the finishing touch I needed a title. 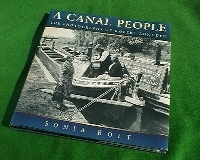 The working title was Canal People, taken from the title of Sonia's book, but that would have been too obvious - titles should be enigmatic. I always think that an unimaginative title is likely to be the precursor to an unimaginative film. Listening to Sonia's words again I realised she'd given me the perfect title when she described them as 'really very splendid people'. So that was it. 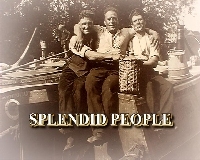 For a title background I selected a photograph of a group of three jolly-looking boatmen sat on top of a narrowboat and clutching a jar of cider. Using Photoshop I gave it a sepia look, faded round the edges in the manner of an old photograph. The BIAFF judges queried my use of a picture of only men when the emphasis in the film tends to be on the women. The commentary was to be read by my regular narrator, fellow club member Geoff Parkin. Former amateur thespian Geoff speaks well and has the ability to pick up a script, scan through it once, then read it straight through, usually without a muff. Most retakes are due my changing the intonation of a particular word. My normal method is to record from a professional Sennheiser microphone onto VHS tape. I can then just select the best passages for capturing into the computer. Finally, I needed some music. I'd particularly arranged the narration to leave interludes for music and pictures only. The music is from film library discs collected over the years, including some from the sponsor's prize that I received when Waterway to Wales won Best Use of Sound at BIAFF 2004. 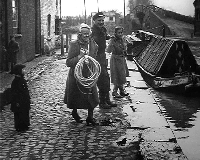 As copies of the film would be going to the Waterways Museums at Gloucester and Ellesmere Port I thought it best to use copyright-free music on those, so a version 2 was created. It's my policy to leave a film in the computer until after it's been in two or three competitions. Splendid People has had adjustments in accordance with judges' comments in three competitions - including the replacing of a commentary line. I was pleasantly surprised when it received five stars and even more surprised when I found that there were only five winners at that standard. Anyhow, Sonia is very pleased with it and now shows it whenever she gives her frequent talks about her life as a boatwoman. This is the third canal film I've worked on. I wrote and edited our club production Restoration: Impossible, which was awarded the Denham Gold Cup for the best club entry at BIAFF2002. That was about the construction, decline and restoration of the Huddersfield Narrow Canal. Then in 2004 Waterway to Wales, which is about a narrowboat journey along the Llangollen canal. 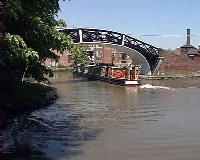 However canals are not a special interest - history is my particular interest - I enjoy doing the necessary research. A prime example is Bailey's Bath, a film about a long defunct open air swimming bath in the Summer Wine town of Holmfirth. Produced for Huddersfield Video and Ciné Club by myself and Trevor Spencer it won the Denham Gold Cup and the Best Documentary Award in 2000. When I embarked on Splendid People I thought it would be a simple matter to fit a few photographs to a voice-over and some comments from the Sonia interview. How wrong I was - I've decided that live-action films are much easier!